Today confusion abounds when it comes to understanding the real story of Biblical tradition. This is a direct consequence of the mistranslation of words to suite the laws made and enforced by a very strange wordplay religion. In the mixing of two formats a religion has achieved a total confusion of the original tradition within the Bible and secured for itself the channel for humanities prayer, or, a strange religion has managed to intercede between humanities connection to the heavens and to capture that energy to fuel their own agenda. Perhaps one of the most useful mistranslations for the religions in diverting your prayers to heaven unto itself are the manipulations around the word ‘Gentile’. First we must remember that it is a fact that the original Biblical tradition was written in Hebrew, that the New Testament was first written in Aramaic and then translated into the Greek for western folks to study. Aramaic was very similar too but not the same as the Hebrew. The word Gentile is not to be found in any Hebrew nor Greek translations of the Old and New Testaments, as a word there are no similar words that correspond to it in Hebrew. When the word is found in the Bible what you are reading is a mistranslation of the Hebrew word Goy, in the plural the word Goyim. It is a fact that today that the entire western populations have been and continue to be coerced to believe a deception about themselves as a race, specific to our relationship in the israelite tradition, a deception under which we are told we are to see ourselves as the ‘Gentiles’, within the commonly held idea that such a label is to represent the difference between the Jews and the none Jews. The profundity of the deception must be fully understood by Christianity as a whole, whether you go to a church or not. In Hebrew the term ‘Goy’ translates as ‘Nation,’ or race, a fact that begets a serious question, why have successive priesthoods deliberately used the false interpretation and fixed it into the Biblical tradition? Before we look to inquire why, we must look at the occasions in the current tradition when those hiding the truth of the matter had to use the correct translation or expose themselves as charlatans, the unclean of spirit. Not to translate this passage correctly would clearly expose absurdity. If the word Goy as is directed today by the Church actually meant Gentile in the terms dividing Hebrews and Christians, then the passage in Genesis above would be absurd. In the Greek translations of the New Testament which are taken from the Aramaic, the term ‘Goy’ is always translated as ‘Ethnos’, which means exactly the same as the Hebrew ‘Goy’ to mean nation, race, of the same ethnicity or tribe. Never would the elders of the Jews have praised the gentiles amongst them nor would it be fact that the Roman would have built a Synagogue for ‘Gentiles’, as such we have another example of the forced correct translation of the Greek term Ethnos to be the same as the Hebrew Goy, both translate as nation. The Greeks when describing all peoples that were not Greek used the term ‘barbarians’ at all times in all cases, the term Gentile is not to be found at all in the Greek language and therefore not responsible for the deception, the deception came after. The Apostle Paul declared in Acts 22 that he was a Roman citizen by birth, he was also a very well educated man and recognised the distinction and of Greek idioms which is declared in Romans 1 Verse 44 : “I am debtor both to the Greeks and the barbarians, both to the wise, and to the unwise.” Paul never used the term Gentiles in any of his Epistles. The word Gentile is derived from the Latin ‘Gentillus’ and means one who is not a Roman citizen. In about the fourth century AD some three centuries after the last book of the New Testament was written the Roman term Gentile was expanded to mean more than its original concept, it expanded to encompass the heathen peoples, the pagans, and all those not Jewish or Christian alike. 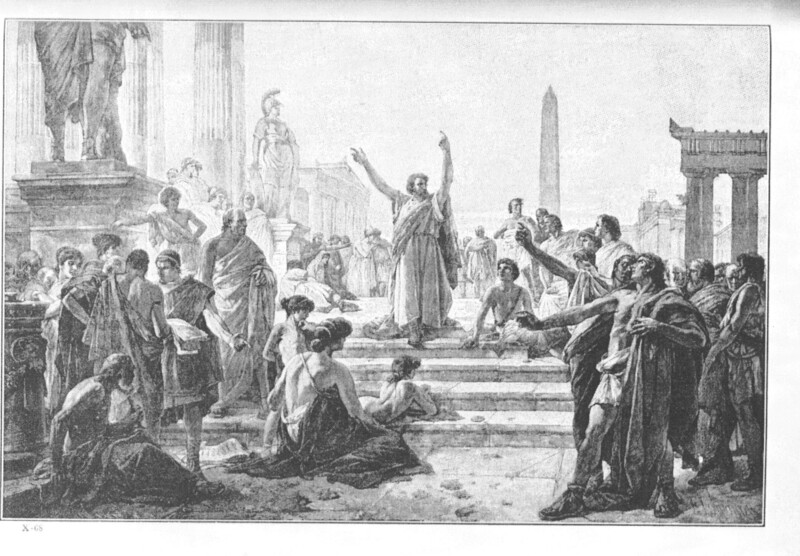 In the centuries after Jesus, Jews were called Jews and Christians were called Christians, the term Gentile thus became a distinction between Roman and none Roman nations, and because the Church of Rome was formed in the Fourth century, never in it’s early translations did the term Gentile become synonymous with a Christian. But of its original meaning Jesus and his Disciples would indeed have been rightly called Gentiles as none were Roman citizens. Jesus was of the Israelite Goy. The next question to be answered would be who were the Jews in the days of Jesus? Where they a representation of the Israelite tradition or where they the followers of the Talmud?